The 20 Francs Belges gold coins are historic coins minted in the nineteenth century under the reign of Leopold II who was a Belgium monarch between 1865 and1909. The Belgian 20 Francs were minted between 1870 and 1882 and are one of the most frequently encountered gold coins when it comes to Belgian gold coins. Other coins minted by the Belgium government are the 10, 25, and 40 francs and as the most recent issues we could mention ECUs and Euro coins. Some of the coins minted by the Belgium Mint have French and Flemish inscriptions. The variety presented on our website for the 20 Francs Belges is in French inscription. The high purity of 90.00% of the Belgian 20 Francs makes these gold coins to be desired by investors and collectors alike. The 20 Francs Belges gold coins contain 0.1867 troy ounces of gold, the equivalent of 5.81 grams. The total weight of these gold coins is 6.4516 grams and they have been minted in a diameter of 21.5 mm. 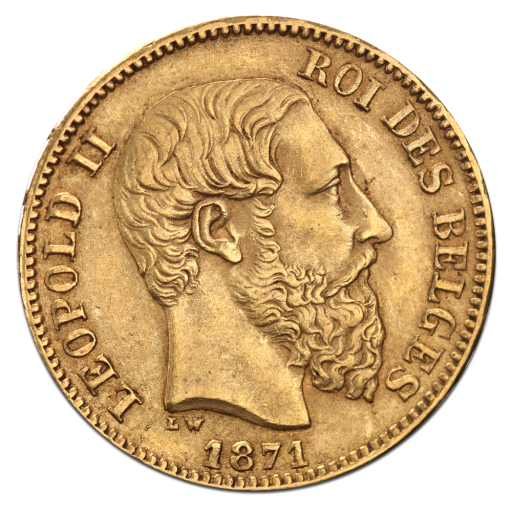 The obverse of the 20 Francs Belges gold coins is a reminder of the fantastic reign of Leopold II who was King of Belgium during 1865 and1909. He is sometimes remembered as the Builder King due to the many buildings commissioned in Brussels, Ostend and Antwerp under his reign. The memory of the King of Belgium Leopold II is vivid because he was the monarch that colonized Congo in 1876 by hiring the famous explorer Henry Morton Stanley to do so. King Leopold II has his portrait on the obverse of the Belgian 20 Francs gold coins facing right, being surrounded by the words "Roi des Belges". Also at the bottom it is written the year "1870". The reverse of the 20 Francs Belges gold coins depicts the crowned arms of Belgium. In the center is illustrated a lion rampant with the inscription L'UNION FAIT LA FORCE. The value of the gold coins is also presented on the reverse of the Belgian 20 Francs as "20 FR". On the edge of the 20 Francs Belges gold coins there is another inscription "DIEU PROTEGE LA BELGIQUE". Their scarcity makes these coins very desirable by investors and collectors alike. And when we add their classic beauty representative for all European gold coins, we obtain some amazing coins in the form of the Belgian 20 Francs. The 20 Francs Belges gold coins offer investors financial privacy and are free of taxes. The scarcity that is characteristic for the Belgian 20 Francs is translated for investors in the following manner: during periods of high demand investors will benefit from higher premiums. Whether we are talking about a person that has just orientated his attention towards investments into gold, a person passionate by history, a numismatist looking for adding the next piece at his collection, or a professional trader, the Belgian 20 Francs are appropriate gold coins for everyone.